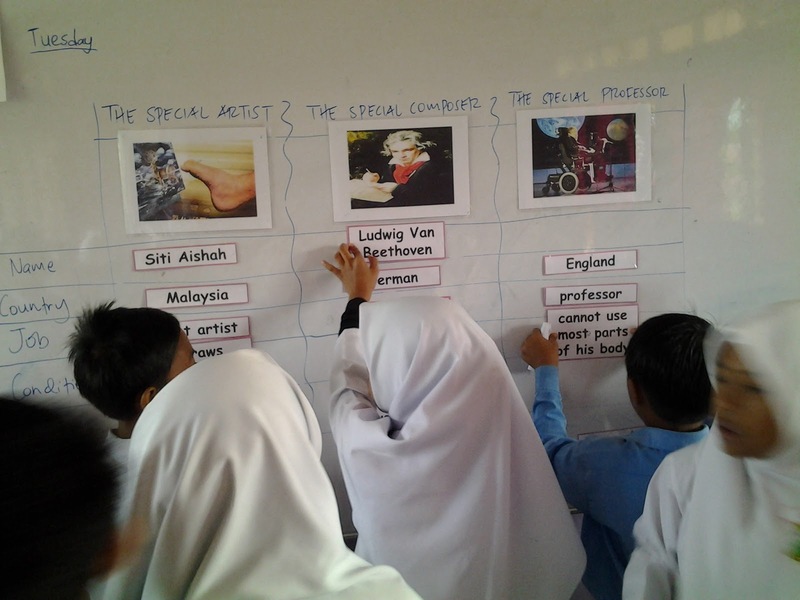 In this post, I'm going to share some activities based on a sub-topic in Unit 1 of the KBSR Year 6 textbook. 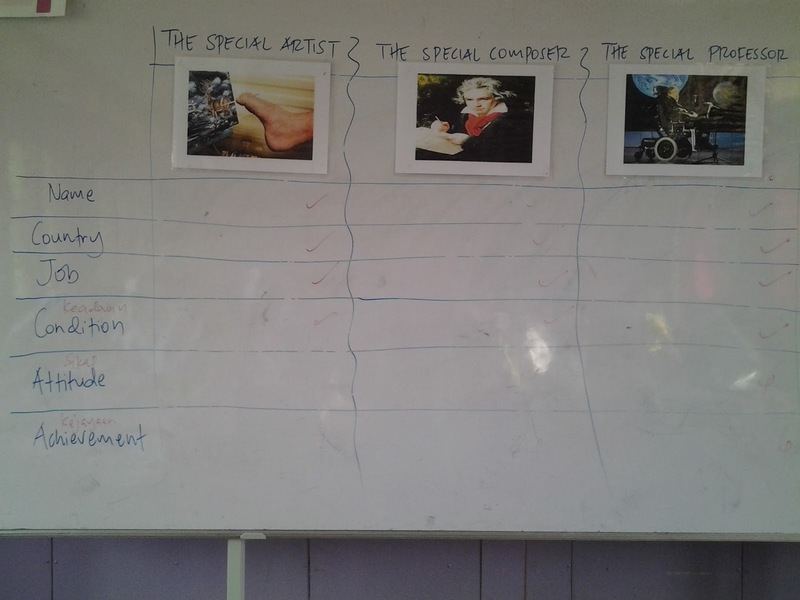 The sub-topic that I've chosen is called 'Everyone is Special'. 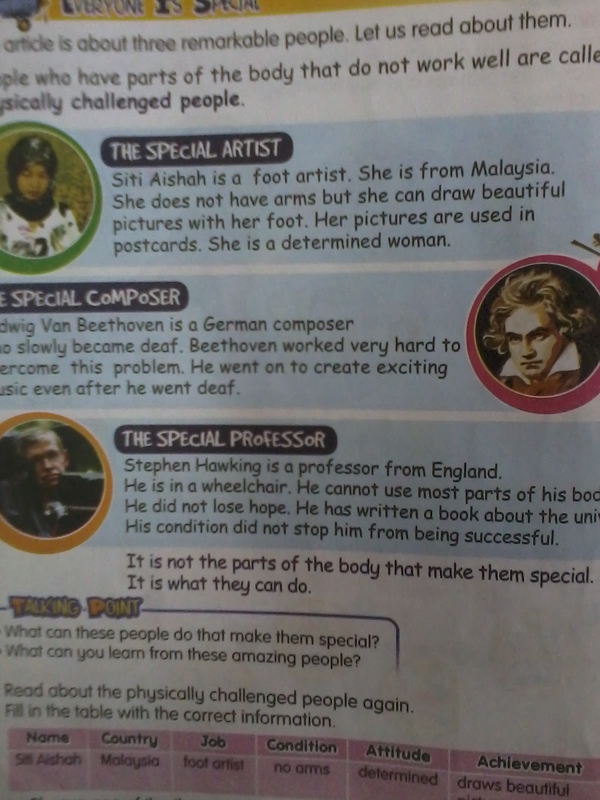 It is about people who are physically challenged, and the textbook has a reading text on three special people: Siti Aishah, Beethoven and Stephen Hawking. I realise that this is a topic from the earliest unit, and so most of my colleagues have already done it with their Year 6 students. But I decided to share this because it's one of my favourite lessons. My students enjoyed the activities, and I could see how the topic had sparked their interests, ignited their curiosity and made them want to learn more about the lives of amazing, inspiring people. I will divide this lesson into three parts. 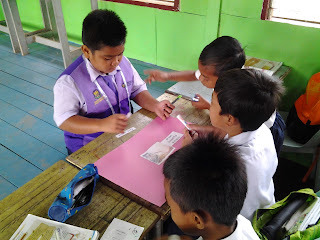 In Part 1, I will share the activities for reading and information transfer. 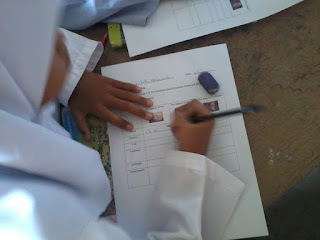 Part 2 is about paragraph writing. Part 3 is an extension lesson - lesson activities that are still dealing with the same topic but go beyond what is in the textbook. 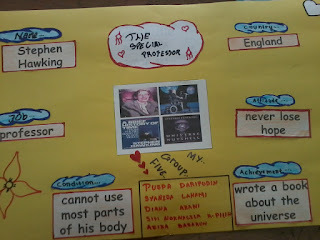 So, here is Part 1.
Who is the most special person to you? What do you like the most about this person? 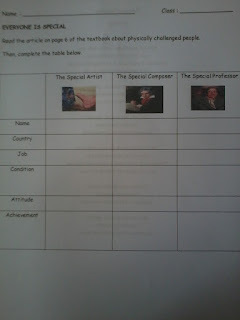 I asked a few volunteers to share their special person with the class. Then I proceeded to tell the students that they are special, too - each and everyone of them. Ali is special because he likes to help people. 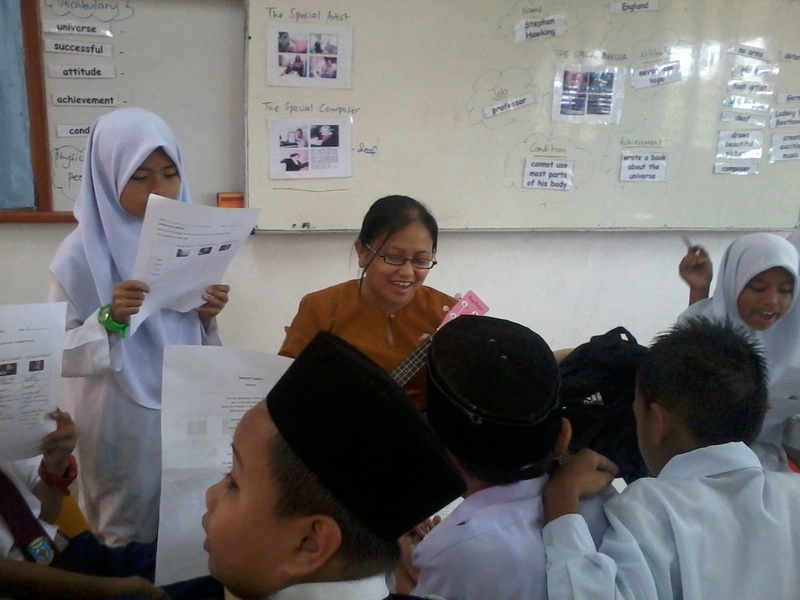 Siti is always the first one to arrive. Razi has the most beautiful smile, it brightens my day and for me that is so special. 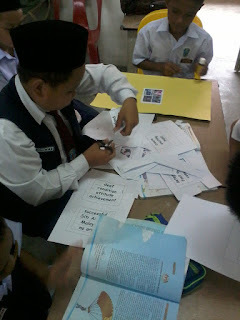 A lot of you in this class can read and draw very well. 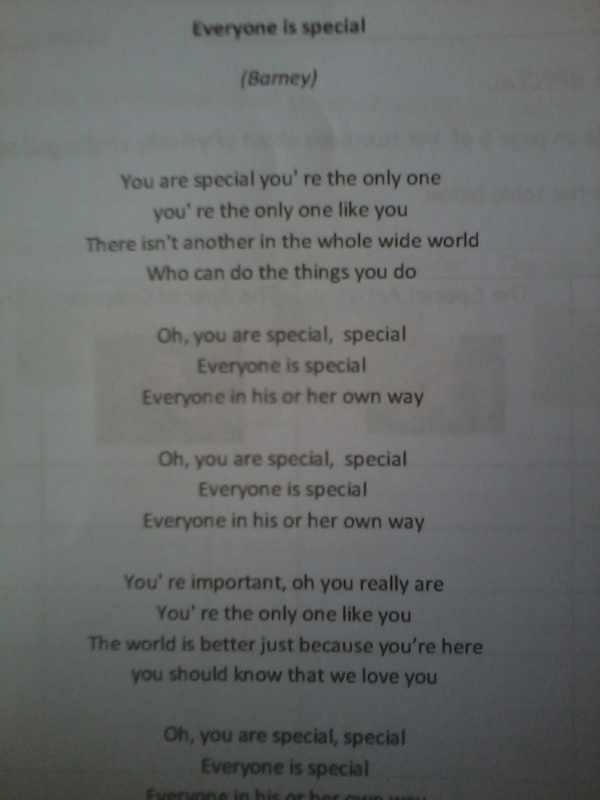 Yes, you are all special. 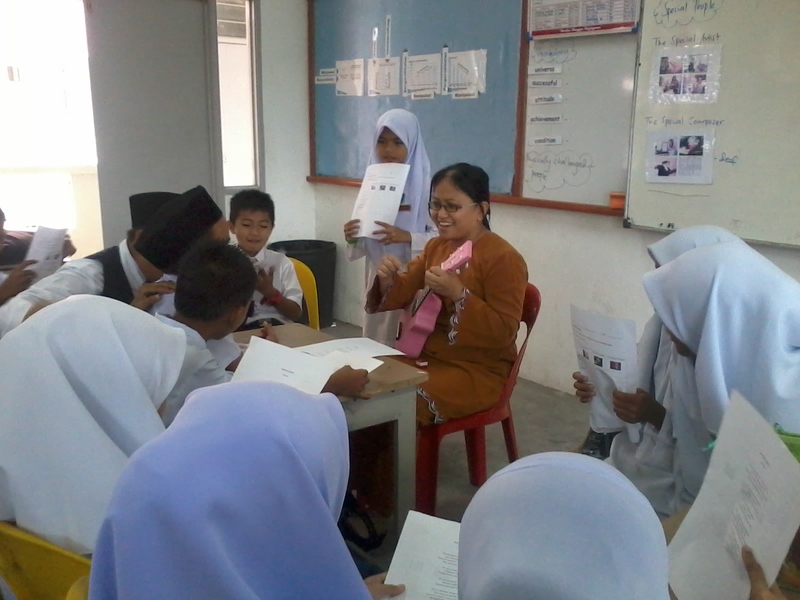 I asked the students to turn to the person next to them and tell him/her why he/she is special. 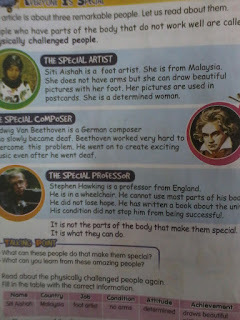 Before reading the text, I showed the students pictures of Siti Aishah, Beethoven and Stephen Hawking. I told the students that these three people are very special, and that they have some things in common. 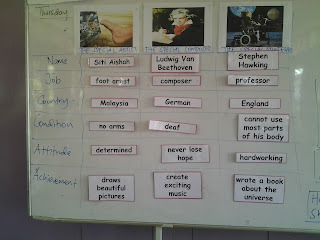 I wrote the phrase 'physically challenged people' on the board and explained what it means. 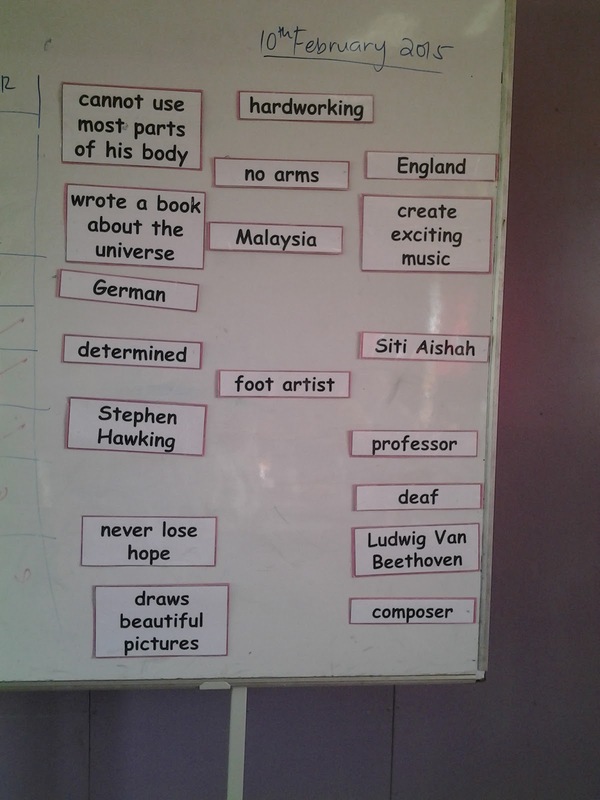 The students listed some conditions suffered by people who are physically challenged, e.g. blind, deaf, mute, on a wheelchair, no arms or legs etc. Then, we read the passage together. 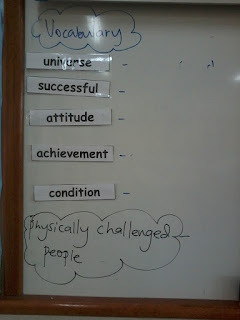 We highlighted the difficult and unfamiliar words. We used the dictionary to find the meanings of the words, and the students wrote them down in their little vocabulary books. 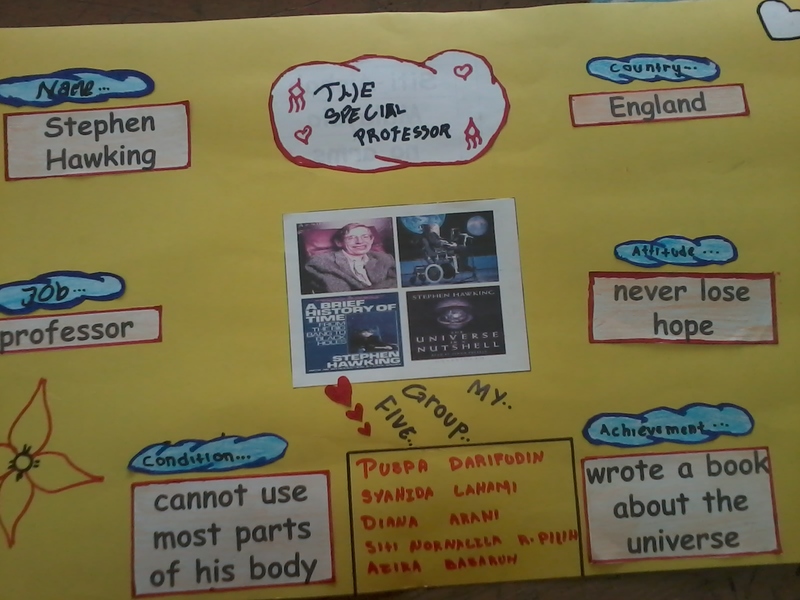 I printed the information about the special people on cards and put them randomly on the board. 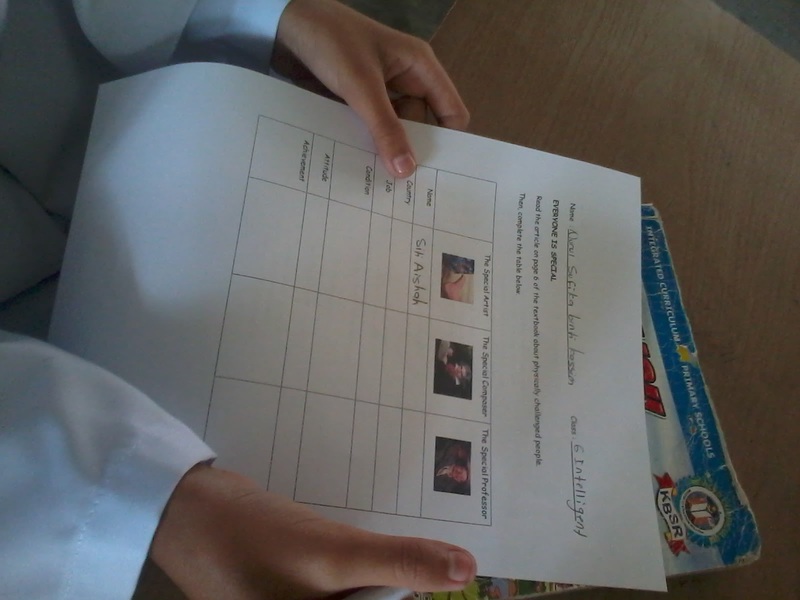 The students read the text again and tried to match the information to the correct person. I divided the class into small groups of four or five. I gave each group a packet containing pieces of paper with information about the special people printed on them. 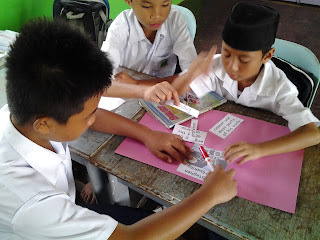 Each group would also have a piece of manila card. The students' task was to choose one of the special people and create a graphic organiser about the person. The next activity is an individual task. The students had to transfer the information about the special people into a table in the worksheet provided. To wrap up the lesson, I asked the students a few questions about the special people. Which one is your favourite? Why? What makes this person special? 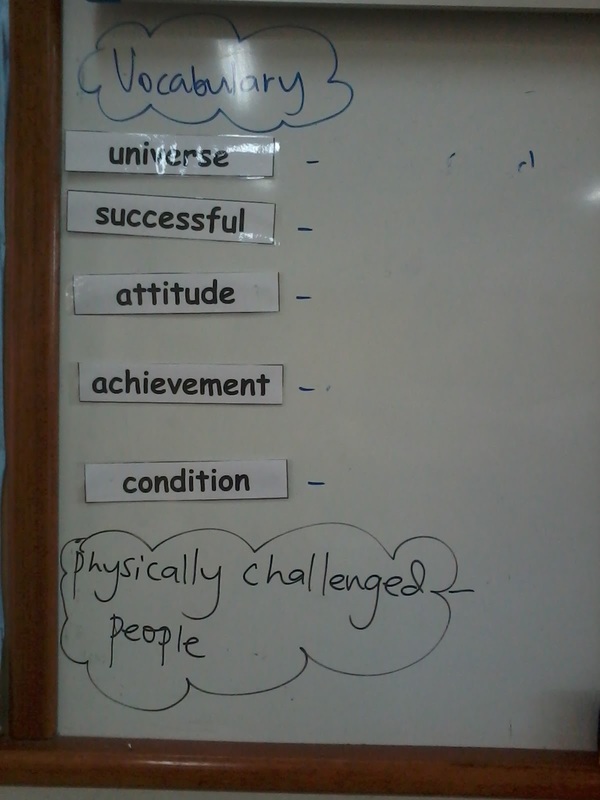 We revisited the statement that I had written on the board at the beginning of the lesson. Everyone is special. 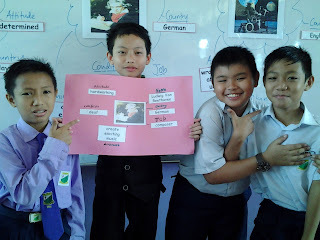 I led the class to discuss this line: "Everyone is special in his or her own way." How are these people special in his or her own way? 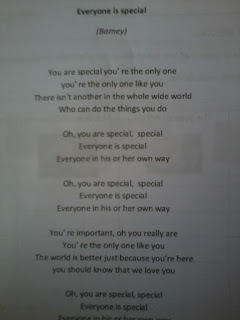 I distributed the lyrics to the song from 'Barney'. We read the lyrics together and discussed the meaning. Then, we sang the song together. 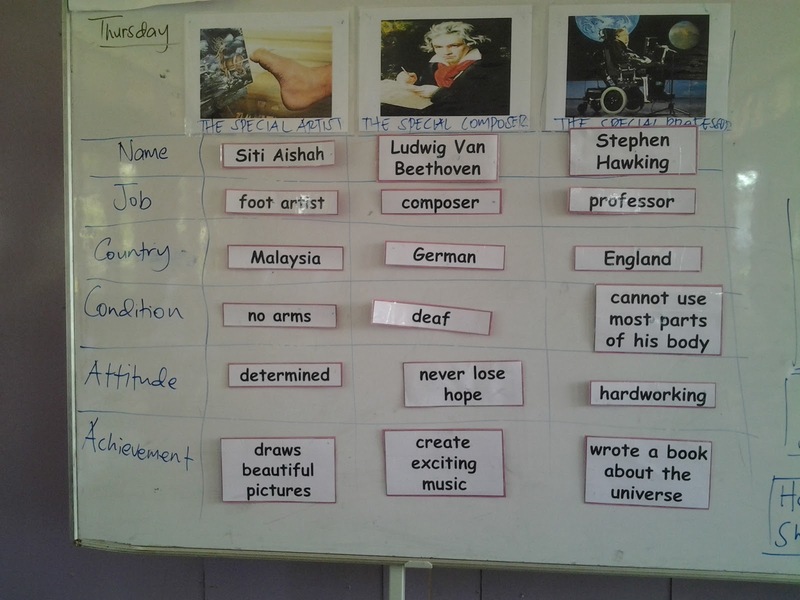 I didn't realise how much impact the lesson had on my students until they bombarded me with questions about Stephen Hawking a few days later. 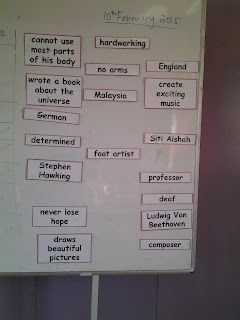 During the lesson, I told the students about how, despite losing the ability to move and talk, Stephen Hawking is still able to communicate with people with the help of a computer. 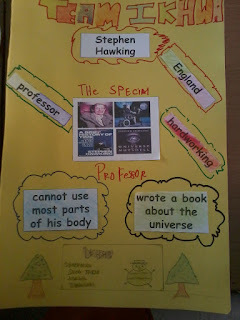 I told them how Hawking's cheek movements are detected by an infrared switch that is mounted on his spectacles, and how this switch connects him to the computer that he uses to type sentences which he sends to the speech synthesiser. The students found it amazing and they told me that they really, really wanted to hear how he sounds like. So I did some Youtube search and found this video of Stephen Hawking, which I showed to my students in our next class. The students thought it was fascinating, and one thing just led to another. 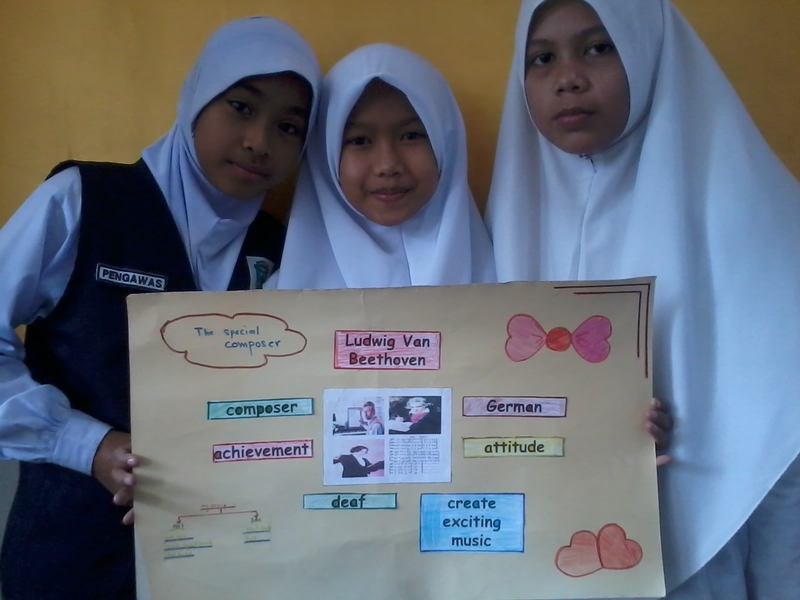 They started to become curious about Beethoven, the deaf composer and begged me to find a video about him. 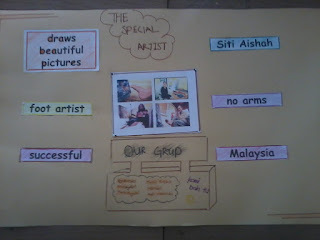 Unfortunately, I wasn't able to find anything on Siti Aishah on the Internet. To satisfy the students' curiosity, I searched for information about foot artists and about amazing people who were born without hands. 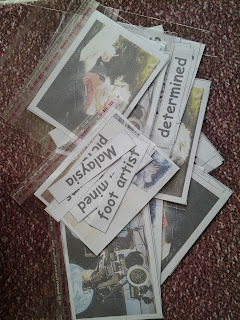 I couldn't find any good video about foot artists that I could use for my lesson. But I did stumble upon something else that is as amazing and that I'm sure would fascinate and inspire my students. If you're teaching Year 6, I'm sure you've covered this topic with your class. 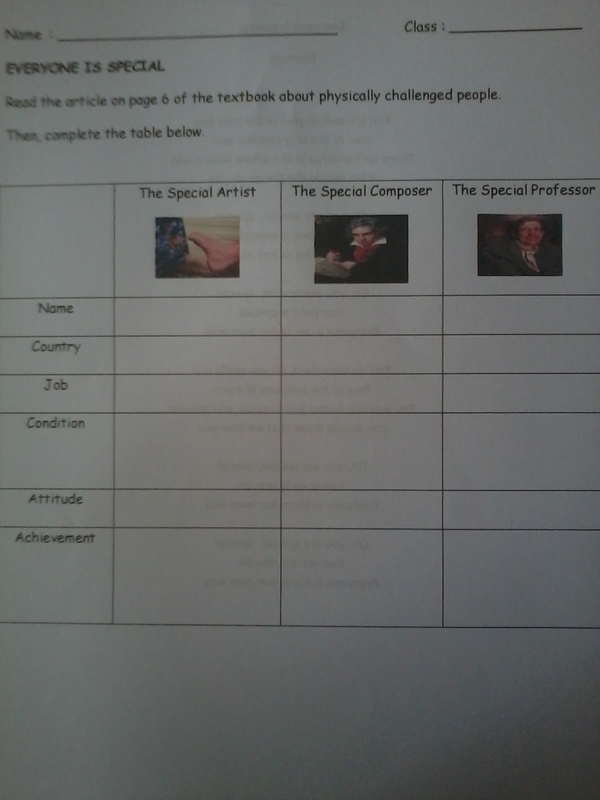 But I'm making these materials available for download in case you'd like to use them for revision activities. If you're not teaching Year 6, these materials can be used in any Level 2 classes, too. For more downloadable materials based on sub-topics in KBSR Year 6 textbook Unit 1 (Wonderfully Made), go here.